Your Twitter profiles are going to witness a humongous change. A change that will blow your mind away! Twitter is, at present, implementing a profile redesign for all users. The new design is geared towards focusing on the brilliant content that you share on Twitter. This redesign is likely to open new vistas that can help brands and business enterprises prosper in a way never known or even imagined before. Visual content including images and videos are going to see a tremendous uplift. The most popular tweets that are able to make positive vibes among audiences will get unfathomable boost. And all the digital marketing experts and internet marketers will do their level best to figure out how best to utilize the new opportunities provided by redesign of our Twitter profiles. As you wait for the Twitter makeover to be rolled out to your computer screen, you will also be looking to strategize for the future. 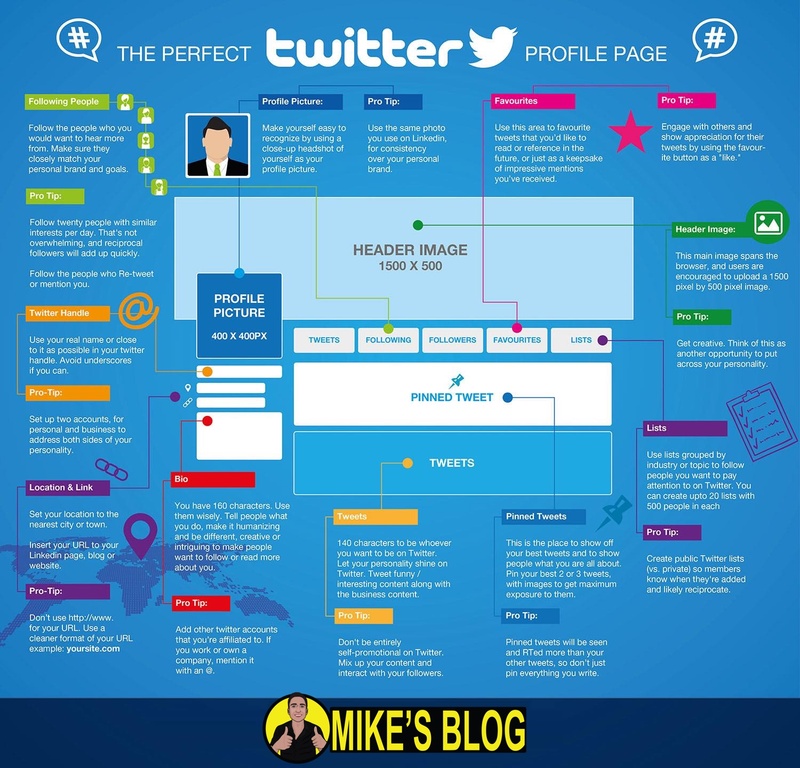 We have dug deep and compiled some twitter tips from stories of the past, some research studies focusing on the psychological aspects of digital marketing plans, and also how we can blend all these magnificent variables to forge unbeatable tips on how to manage your new look Twitter profile. A lot of people have been wondering that the Twitter profile makeover gives a semblance of similarity with some other famous social media platform. What the heck! Let’s name it: it appears quite similar to Facebook! Header Image that can be Customized: This main photograph is of the same width as the browser. The Twitter users are asked to upload an image with dimension 1500 pixels by 500 pixels. Your existing header image may work but since the scale has been increased, so it may look a bit blurred. Remember that image sizes are relative to devices on which they are being displayed. Hence, twitter layouts will vary from screen to screen. Best Tweets: The tweets that are able to get the most engagement among your twitter followers will be displayed in a larger text size in your Twitter stream. Pinned Tweet: You will be able to pin your most popular or preferred tweet to the top of your Twitter profile. Hence, when someone visits your profile, they will be introduced to the kind of content that you are interested in. Filtered Views: When you are visiting a profile of someone else, you can choose a number of views. You can either view tweets only, tweets plus replies or tweets with videos and images. Pinterest Style Grid View will be displayed. It will include your followers, people that are being followed by you and your videos and images. Compiled after devouring countless help pages, image cheat sheets and far too many social media blogs. This Twitter media size guide is intended to act as one-stop resource for quickly referencing the latest recommended image sizes for use on Twitter. Your Twitter profile photo is the main image for your profile across the networks and will be displayed on your profile page, alongside your tweets and in any ads or recommendations linked to your account. This should be a unique image that is representative of the content found at the link. The image for this type of card will be seen in various places at sizes of 120 x 120 px and 120 x 90 px. This should be a unique image that is representative of the content found at the link. The images for this type of card will be shown at varying sizes depending on the type of device. These tweets place an emphasis on the photo and will retain the aspect ratio without cropping in most cases. The image will be seen at sizes of 375 x 435 px and 375 x 280 px as well as 750 x 560px depending on the device. The images in this card should follow the general guidelines for photo cards, however they will be displayed at varying sizes depending on the number of images, viewing state and device. This image will actually be pulled from the relevant app store however to ensure the best experience on Twitter, you should make sure that the image you have uploaded to the app store is less than 1 MB in size. Whilst embedded the player card displays videos, audio players and animated GIFs at no larger than 435px and will always maintain the original aspect ratio. You will need to specify a thumbnail image for browsers that don’t support embedded videos. The image should be at the same dimensions as your video where applicable. Video: H.264, Baseline Profile (BP), Level 3.0, up to 640 x 480 at 30 fps. All product cards will be cropped to 160 x 160 so you should aim to provide a square image with your product image displayed at the appropriate proportions within. Lead generation cards are shown above a call-to-action button with a full tweet above them so you should take the layout as a whole into consideration whilst designing. These cards are slightly taller than the lead generation card type however they maintain a thinner profile than full photo cards and are designed to get people taking action. I love sharing and helping people who can use social media for their businesses and I enjoying helping out with answers to those social media questions here . Since last 6 years I've been writing, engaging and selling online on my twitter channel. I keep everyone updated with my fun tweets. On a personal note - I'm a Blogger, Writer, Social Media User, Amateur Foodie and Beach whisperer...Don't forget to visit my other blog and social channels Twitter and Facebook. 2019 TwitterBackgroundSize.com Design. All rights reserved.